First Line: Imagine waking up one morning to learn you had won the lottery. By fair means and foul, Cornelius "Commodore" Vanderbilt built a fortune of $105 million in the mid-nineteenth century. One hundred years later, most of that fortune was gone. 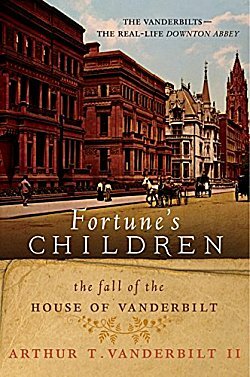 In Fortune's Children, Arthur T. Vanderbilt II paints a vivid portrait of his ancestors. The Commodore is one of the most important capitalists this country has ever produced, and with the marriage of his great-granddaughter to the Duke of Marlborough, this book will make excellent reading for any fan of Downton Abbey. The author states that the fortune dissipated quickly because the Commodore was the first and only Vanderbilt who was obsessed with making money. The Vanderbilt men who followed were obsessed with keeping it. You need both to maintain those bank balances. Some-- like Alva Belmont Vanderbilt-- were obsessed with spending it to ram their way into New York's high society. Alva built some of the largest and most ostentatious homes ever to grace these shores, and the houses' interiors were even more lavish than their exteriors. Each of the author's ancestors is portrayed with wit and sorrow, which can often happen with the "advantage" of hindsight. This is an absorbing tale of greed, snobbery, and profligacy that kept me fascinated from first page to last. If this is your cup of tea, I urge you to pour yourself some. OOoh, I do like history, Cathy. And those famous families like the Vanderbilts really are interesting. This does sound great! The Vanderbilts do seem to have more than their share of "characters," Margo!